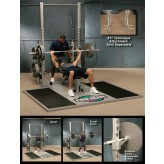 Compact design is less than 8 foot square including optional leg press. 1" shafts and pillow block bearings on all press arms, large diameter pulleys, 1/4" 4000 pound cables, and .120 wall tubing ensure durability and quiet, smooth movement. Standard 2:1 cable pull to weight ratio. Optional 4:1 cable pull kit available.